This picture is from Halloween 2011. The picture was taken about an hour before we were snowed in and lost power for a week. We spent our Halloween snowed in playing cards with candles just laughing about how we spent weeks on our costumes and never got to show them off. So now I am showing them in this contest. This is only about half of our crew but because of the storm we never met up with our Batman, Joker and Poison Ivy. The most time consuming part of these costumes was all the thrift store shopping. Every item from the suits, cat women’s leggins, boots and Robins skirt all at thrifts stores. For a quick breakdown Robins costume consists of a skirt, red tank top and green short sleeve shirt just overlapping. Her cape is a yellow shirt we cut up and sewed to her shirt. Added a 50 cent eye mask with red arm sleeves and you got ”Robin”. “Two Face” was very simple we just cut two suits and sewed them together. For “Cat Women” it was separate pieces of black clothing and all I had to do was buy a cat women’s mask and sewed on a cat tail made up of fabric. 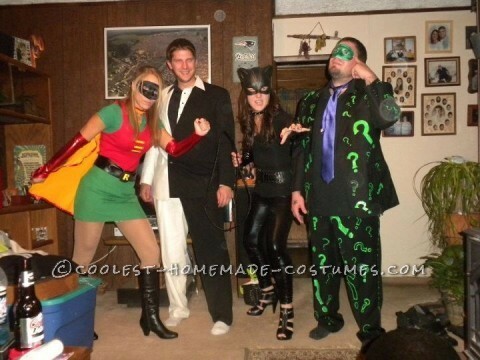 The Riddler is another costume that was cheap but took time to make. Since I could not find a green suit I decided to change it up and go with a black suit and took glow in the dark gel clothe writing and drew on question marks all over. He was supposed to dye his hair orange but by this point we knew we were snowed in for the night. Even though we didn’t get to go out an enjoy these costumes we made the best of it at our own house. Hope you enjoy the picture.